THE NEWEST MECHANICAL ATTRACTION IS NOW IN ATLANTA!! MEET "HARLEY THE HOG"
And what else would you expect from the Safest Bounce in Town, than the Safest Hog Around?? To cushion the inevitable fall off is a large soft inflatable air mattress of fire retardant PVC. The unit is competently controlled from the sophisticated control console by our trained operators to ensure your safety and enjoyment. A mechanical ride is always a great time for your guests, and it’s now easier than ever to throw hog riding event/competition at your next party. 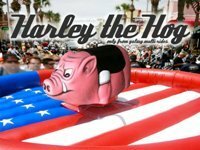 Contact Laser Sporting today for details on how to bring Harley the Hog to your next party, festival or event. Why should you partner with Laser Sporting for your mechanical hog rental? Add Harley the Hog to your next event.